Let us take the stress out of shopping for a mattress: you’ll be counting sheep in no time with our list of the best on the market. 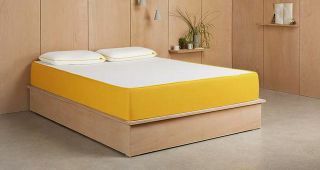 From memory foam to innerspring, extra-firm ortho to soft and squidgy, we cover them all in our round-up, helping you to get the best night’s sleep for your buck. To paraphrase the great Beyoncé Knowles, the pursuit of a good night’s sleep can either be a sweet dream, or a beautiful nightmare. Well, just a nightmare, really. We’re often told how crucial it is to our overall health and wellbeing to get our rest, and how a good mattress can either make or break it — which is a lot of pressure, if you think about it. But with a little bit of analysis when it comes to our needs, and some generous try-before-you-buy policies from mattress retailers, it can be surprisingly painless. Keep reading for our advice on how to buy, and our top 10 choices, to find the best mattress for your needs. Latex foam mattresses are breathable and cooling, good for people who tend to overheat during the night, and for people who suffer from allergies or asthma. Memory foam mattresses are typically firm, which is good for those who need extra support, and adapt to your shape, ideal for scoliosis sufferers, but some people don’t like the slight sinking motion or how warm it gets. Then there are the springs: open spring mattresses are most common in affordable mattresses, while pocket spring mattresses tend to be more expensive, but minimise the risk of you rolling into your sleeping partner. Even if you don’t have any medical requirements, your sleeping position can be a huge factor in finding the ideal mattress. Side sleepers will benefit from a plusher, softer surface that relieves pressure on the shoulder and hip, while back and front sleepers should plump for a firmer surface to correctly support the spine. If you are unsure, or feel uncomfortable stumping up the cash for such an investment purchase, keep your eyes peeled for brands such as Eve or Casper who offer a 100 night trial with some of their mattresses, making it relatively risk free. Casper are suspicious of springs, calling them “outdated technology”. Instead, they’ve cleverly combined the adaptive support of memory foam with a breathable top layer to minimise sinking and stickiness, for the perfect night’s kip. It’s firmer than your average, offering good support for joint- and back-pain sufferers, and has a removeable washable cover. Overall, it’s a thoroughly good all-rounder for back, stomach and side sleepers, and you can try it for 100 nights to see if you agree. The combination of memory foam and high-quality pocket springs in this medium-firm mattress will suit most sleeping needs. Perfect for those who sleep with a partner, the individually responsive pocket springs provide zoned support, as well as pressure relief across the board. Sleepers who suffer from skin or respiratory conditions can also rejoice that it’s hypoallergenic and dust mite-free resistant. All very impressive for the budget price. Despite being far and away the cheapest mattress on our list, the IKEA Morgedal scores highly in the support stakes. The high resilience foam responds to your movements, giving vital support to each bit of your body even if you’re a highly migratory sleeper, and its firmness makes for good spinal alignment and support, pressure relief and proper weight distribution. With its bargain price tag, this is a great mattress for guest bedrooms. At more than double the price of some of our mid-range picks, the Vispring Hanbury mattress is clearly marked as a luxury buy before you even get down to the details — but what details they are. Each one is hand-crafted, hand-stitched and hand-tufted, and combines a high-end pocket spring core with layers of buoyant horsehair and British wool fleece for support without hardness. If you have a commitment to reshoring and ethical manufacturing, and have room in your budget, this mattress is a solid investment. The Sealy Activ Latex 1400 brings the benefits of Innergetic latex and individual pocket springs for a sumptuous night’s sleep. The encased springs provide individualised support and keep the mattress from sagging, while the latex layer provides pressure relief. It’s all topped off with eco-friendly Tencel fibres, which keep you cool during the night and won’t set off allergies. If you’re a sensitive sleeper who tends to overheat, this is a very good buy. The Leesa Mattress utilises Avena foam, which is a harder-wearing alternative to latex, and memory foam, for the best of both worlds. It’s pleasingly bouncy, and expertly contours to the shape of your body, as well as your weight and sleeping style. For those who like the firmness and support of memory foam but find they overheat, this is the perfect choice. For the same comfortable cooling appeal in a foam/spring hybrid, go for the Sealy. This medium firmness memory foam mattress was awarded an elusive Which? Best Buy in 2016, and we can see why. With its woven-in carbon fibres and trademarked Sanitized protection, it’s anti-bacterial, anti-microbial, and anti-dust mite, making it the best mattress for allergy sufferers on our list. Plus, the individual pieces of memory foam adapt wonderfully to the contours of all sleepers. Yet another Which? Best Buy, the Silentnight Mirapocket enlists the help of high-quality pocket springs to create a firm mattress for superior back support. It’s a great mattress for sharing, with the encased springs offering individual comfort zones, and the zonal support is excellent at targeted the bits of the spine that need more support. If you suffer from back pain, scoliosis, or any related complaints, this is a great mattress, for a great price. Another wonderful all-rounder, the Simba Hybrid gets its name from a combo of memory foam and pocket springs (well, the second bit, we think the first part is from The Lion King). With five luxurious layers of foam and spring, it moulds beautifully to your individual sleeping pose and body shape, so if you roll over during the night, it won’t take forever to get comfortable again. How do they know it works? It’s been extensively tested with the Sleep to Live Institute, whose wealth of extensive research based on profiling is second to none, so it really is suitable for everyone. Once you've picked your ideal mattress, it's time to start bringing peace and tranquility to the calmest room in the house. Check out our round up guide to the best bedroom lamps, from natural wake up lights to designer pieces.